August Skywatching: Is Comet ISON's Future Bright? The sun-approaching Comet ISON floats against a seemingly infinite backdrop of numerous galaxies and a handful of foreground stars in this Hubble Space Telescope composite image, taken in April 2013. The potentially spectacular Comet ISON continues to be masked by the glare of the sun as July transitions into August, but the icy wanderer will come into view soon. Things will change during the next couple of weeks, however. On Aug. 10, Comet ISON will be 18.1 degrees from the sun and will begin rising above the east-northeast horizon before dawn. For mid-northern latitudes on the morning of Aug. 21, ISON will stand 6 degrees above the east-northeast horizon at the start of twilight. And by the end of August, the comet's altitude will double to 12 degrees by the time dawn begins to break, making it an easy target for skywatchers. The question is, what, exactly, will observers see? That made the comet about 100,000 times fainter than the dimmest star that can be seen with the unaided eye. The comet continued to brighten slowly until the beginning of this year, and then simply stopped brightening when it reached magnitude 15.5. Astronomers suspect that ISON is a "dynamically new" comet, meaning that it's making its first trip to the inner solar system from the distant Oort Cloud. This could explain the lack of change in ISON's brightness so far: If the comet had never been exposed to intense light and heat, it may have possessed, until recently, a thin coating of volatile material that vaporizes at a great distance from the sun. After this coating evaporated, the comet stopped brightening, scientists speculate. ISON will cross the frost line, which lies about 230 million to 280 million miles (370 million to 450 million km) from the sun, within the next few weeks, scientists say. When this happens, frozen water locked within the comet's 3-mile-wide (4.8 km) nucleus should begin to sublimate (go from a solid to a gaseous state), blasting out jets of gas and dust, and placing the comet back on a brightening trend. But just how bright will the comet be by the end of August? That's the big question that might provide a clue as to what ISON ultimately does when it zips 724,000 miles (1.17 million km) above the sun's surface on Thanksgiving Day (Nov. 28). If the comet is no brighter than 13th magnitude by the end of August, it stands a fair chance of completely disintegrating, either en route to, or immediately after, it rounds the sun. The sungrazing Comet du Toit completely disappeared on its way toward its solar rendezvous in late December 1945. More recently, Comet Lovejoy somehow survived its close brush with the sun in December 2011, even managing to put on a good show for the Southern Hemisphere. But within weeks, it, too, vanished. On the other hand, if ISON is brighter than 13th magnitude, I suspect it will remain more or less intact as it sweeps past the sun. Although the icy nucleus would not completely disintegrate, it might still fracture into several pieces — think of what happens when you pour hot tea into a cold cup. If that ends up being the comet's ultimate fate, ISON might release a tremendous amount of dust, which could produce a spectacularly long and bright tail. Such was the case with the Great Comet of 1882 and comet Ikeya-Seki in 1965, both of which fragmented as they grazed the sun. Will ISON be a dud? 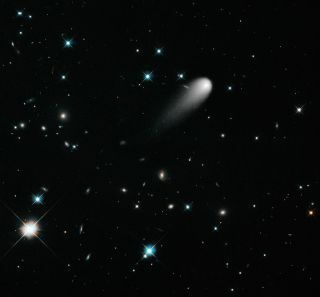 At least one astronomer has already declared that Comet ISON likely is already fizzling out. Ferrin points out that ISON stopped brightening in January and compared it to another comet — C/2002 O4 Hönig — which remained at the same brightness for 52 days, after which it disintegrated with no observable residue. "The future of comet ISON does not look bright," Ferrin concluded. However, it should be pointed out that on Feb. 21, Ferrin issued a statement saying he felt there was a 75 percent chance that ISON "will become as bright as the full moon at perihelion." There was a 25 percent chance it might not get as bright as initially expected but "still will put (on) a good performance," Ferrin added. This flip-flop highlights just how difficult it can be for anybody, even an expert, to predict how a comet will behave as it approaches the sun. Hopefully, we'll have a better idea of what to expect from ISON in our next update at the end of August. Stay tuned! UPDATE: Scientists will be meeting Thursday (Aug. 1) and Friday (Aug. 2) to form a game plan for observing and studying comet ISON during a workshop at the Johns Hopkins University Applied Physics Laboratory (APL) in Laurel, Md. The workshop will be webcast from 9 a.m. EDT to 5 p.m. EDT both days. You can watch live here on SPACE.com, directly at the workshop homepage, or at LiveStream.